The Easter is just around the corner and the Easter Egg Roll held by White House is ready to run. For Americans, enjoying one colorful Easter with president is like the annual event, there are many activities, such as reading and games. As the final Easter Egg Roll of the Obama administration, this year’s theme will be “Let’s celebrate” and the activity will be held on Monday Mar.28th ,2016 on the South Lawn of the White House. A new event called “White House Fun Run” has been scheduled and first lady Michelle Obama’s initiatives will be presented in this time. Except for the Easter Egg Roll in the real life, there’s an awesome online Egg Roll activity from Mar.21 to Mar.31 which is held by WonderFox and 8 acclaimed software developers to give everyone an Easter software giveaway gift! Of course, other Easter freebies are still hidden in the delicate Easter eggs, so grab your basket and get started. This online Egg Roll is only in the Easter giveaway activity page. Remember, all software are only Easter time-limited free, so good luck for Easter egg hunt! American is known for its education and top-quality talents. The government had been invested a lot to education in generation, so did the Obama. According to report, Obama has carried forward the reformation of local government and school during his administration. The continuous growth of education budget also reflects the faith that Obama holds on education. Following government’s policy, WonderFox have prepare one special Easter gift in this Easter software giveaway which is valued $120 for every teacher and student, these useful applications will help each one of them around the world, no matter whether they are at school or home. WonderFox Soft, Inc., established in 2009, is a software developer specialized ultimate home media solution for customers, products, including video/audio converting and editing programs compatible with Windows 7/8/10. 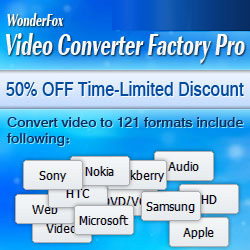 Hot product including Free HD Video Converter. So far, WonderFox has successfully launched many giveaway including “Back to School - WonderFox Best-Selling Line Giveaway + Promotion” “2015 Halloween Giveaway Carnival Night”, “WonderFox Crazy Christmas” and many more. Questions are welcome, contact timothy@videoconverterfactory.com if there’s any. Everyone deserves an Easter gift.